Two characters were added to the upcoming dating sim Namco High. If you've ever wanted to date the Galaga ship, a taiko drum, or a troll, you have the opportunity to do so in Namco Bandai and What Pumpkin Studios' browser-based dating sim Namco High. The troll, Terezi Pyrope, is from multimedia webcomic Homestuck by Andrew Hussie, who is also the creative director for Namco High. Several Namco characters are available in free "datelines," but Terezi and Donko from Taiko Drum Master are available only through "premium datelines." 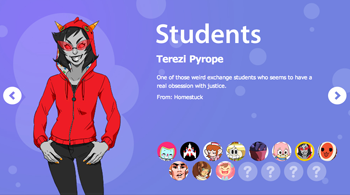 Terezi is the first of three Homestuck characters to be in the game in the premium version. Eight additional Namco Bandai universe characters will also be premium datelines. Free characters include Galaga from Galaga, Lolo from Klonoa, Valkyrie from Legend of the Valkyrie, Anti-Bravoman from Bravoman, Meowkie from Mappy, and Albatross from Rolling Thunder. To top it off, you play as the cousin to the Prince from the Katamari series where you get into trouble quickly and find that "nothing at this school rolls that easily." Different tiers of packages are available for preorder with digital content and physical items. Each of these grant access to the premium datelines. The deluxe pak, set at $14.95, contains all the dateable characters, a digital soundtrack, wallpapers, and an avatar set. The next tier, called the swag pak, is $49.95 and also includes a Cousin t-shirt, sticker, and pin. For another $50 in the messenger pak, you get a messenger bag. The classmate pak, $249.95, also includes a diploma and class ring, and the final cool kid pak also includes a letterman jacket for $499.95. The packages are available for preorder at WeLoveFine.com. You don't have to buy a package to access the premium datelines. Once the game launches, you can buy individual datelines instead of buying the packaged set. Namco High will launch in time for the holidays this season.